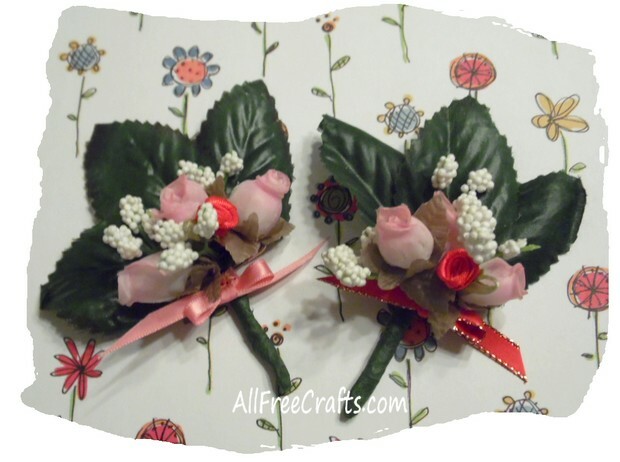 A small posy of rosebuds makes a lovely Valentine either to wear yourself in celebration of Valentine’s Day or to make for someone else to wear. 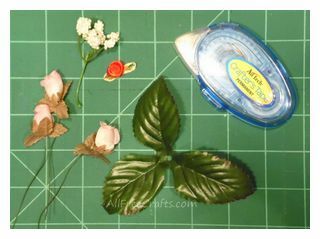 This simple little floral craft is quick, easy, and cheap to make, but the end result is romantic, pretty and loving. Perfect for Valentine’s Day, Mother’s Day, or weddings! I bought the rosebuds for this project at the dollar store. The rose leaves, which usually come in a small bunch of three, are easily detached from most single artificial roses. I managed to sneak these from an existing floral arrangement and no one would ever notice the difference. After the supply list outlined here, I’m including my second-ever video tutorial, edited down to a convenient two and a half minutes so you can get right down to business. If you enjoy it, please leave a comment or feedback, here, or on YouTube. Thank you so much! 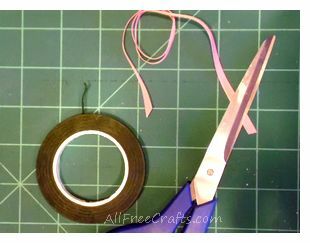 You’ll also need scissors, green floral tape, a length of narrow ribbon (optional) and (not pictured) a pin back or safety pin. View on YouTube: Rosebud Posy Video.